The region of the sky between Virgo and Leo contains an unusually high number of galaxies, known as the Virgo Cluster. This image by Massimo Tosca of Italy shows Markarian's Chain (the curved string of galaxies toward the upper right of the image) and Messier 87, the enormous elliptical galaxy at the lower left. Dozens of other tiny smudges are galaxies, too. From left to right, the image spans an angle of about 100 arc minutes, or more than three times the width of a full moon. Every spring in the Northern Hemisphere, the obscuring stars, gas and dust of our own Milky Way galaxy vacate the night sky, leaving a window of opportunity for skywatchers to peer at distant galaxies. This week's new moon will provide us with especially dark skies for hunting these faint but majestic objects. A galaxy is a massive collection of stars, gas and dust arranged into a 3D structure that is governed by gravity and the laws of physics. Most galaxies have a central bulge of stars surrounded by a thin disk consisting of a ring or spiral arms. Others are formless ovals, or weird funhouse-mirror versions of regular galaxies. The shape and structure depends on how long ago the galaxy formed, how it has evolved since then, and whether it has been altered through interactions with another galaxy. Astronomers classify galaxies based upon their appearance, dividing them into classes, families and varieties much like we do for animals. In this edition of Mobile Astronomy, we'll examine how galaxies are classified and how your mobile astronomy app can help you see these denizens of the galactic zoo through your telescope, or simply enjoy their diverse beauty through pictures in your app. Our Milky Way galaxy consists of a large central bulge of densely packed stars surrounded by a flattened disk of encircling spiral arms. The disk is about 100,000 light-years across, but only 2,000 light-years thick. Our sun is an average-size star located in a spiral arm about halfway out to the edge of the disk — in what could be called the galactic suburbs. When we gaze into a clear night sky, every star we see is another resident of our home galaxy. Our position inside the disk's thickness causes us to see stars in every direction. There are fewer when we look up and down away from the disk, and many more when we look parallel to the disk. In fact, the broad band of stars we call the Milky Way represents the plane of our galaxy projected onto the night sky. It is visibly thickest toward the core, thinnest in the opposite direction, and tapering off in between. Meanwhile, between our galaxy's stars are cold, dark clouds of gas and dust and occasional glowing star-forming nebulas. This material obscures much of the visible starlight emanating from the core of the galaxy, so it's not as bright as it should be. If you've viewed the Milky Way from a dark site, you may have noticed those dark dust lanes running through it. To look at the billions of other galaxies in the universe, we have to be able to peer past the intervening material. Fortunately, spring is a perfect time to do this for skywatchers in the Northern Hemisphere. Our Milky Way galaxy is a barred spiral galaxy consisting of an elongated central core surrounded by a thin disk with spiral arms. The disk is approximately 100,000 light-years across but only 5,000 light-years thick. Our solar system is located in the Orion arm. If we peer into space in directions parallel to the plane of the drawing, we see mostly the material in our galaxy. But if we look in directions perpendicular to the drawing, we can see other distant galaxies without obstruction. Our solar system is tilted with respect to the galactic plane, so the Milky Way's position in the sky varies according to the time of year. In the Northern Hemisphere, it arcs across the summer and winter night skies from south to north — filling the summer constellations of Sagittarius, Scutum, Aquila and Cygnus, and the winter constellations of Canis Major, Orion, Monoceros and Auriga, with rich star fields. But every year during April and May, the Milky Way moves to a position roughly parallel to the horizon, so the overhead night sky is pointed at right angles from the galactic disk and into deep space. With very little material to block our view, a multitude of galaxies can be observed and studied. On spring evenings in the Northern Hemisphere, the Milky Way hugs the horizon, leaving the sky directly overhead free of any obscuring gas and dust — perfect for seeing the myriad other galaxies in the universe. Here, the sky is shown at midnight on April 14 (the next new moon). The location marked "NGP" (the north galactic pole) is at right angles to the plane of our galaxy. 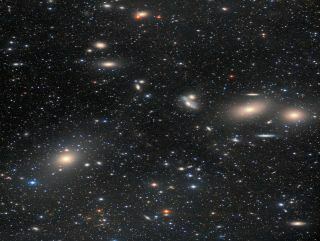 The sky near the constellation Coma Berenices and the region around it (especially Virgo, Leo and Ursa Major) contains a high concentration of observable galaxies. Pull out your astronomy app and locate the constellation of Coma Berenices, or "Bernice's Hair." This patch of sky contains the north galactic pole and therefore far fewer stars than the rest of the sky. It's more or less overhead in April and May — perfect for viewing distant galaxies through the least amount of Earth's distorting atmosphere. Coma Berenices and the constellations around it — Virgo, Leo, Ursa Major (the Big Dipper's home) and Canes Venatici — all host a great many galaxies. Before we hunt some of them down with your mobile device, let's look at how astronomers classify the galactic menagerie. In the early 1920s, at the Palomar Observatory in California, American astronomer Edwin Hubble used a special type of star known as a Cepheid variable to determine distances to objects in our galaxy. These stars' brightness is directly related to the period of their variability. Comparing how bright they appear with how bright they should look tells astronomers how far away they must be. Hubble discovered extremely faint Cepheid variables within the myriad fuzzy patches of light he was finding on photographic plates. He soon realized that those patches, which he had considered "nebulas," must be completely different galaxies situated millions of light-years away from the sun. The universe suddenly became much bigger! Starting in 1926, Hubble developed a system for classifying the new galaxies. First, he divided them into four classes — elliptical, lenticular, spiral and irregular — assigning them the letter codes E, SO, S, and I, respectively. Elliptical galaxies are relatively featureless balls of stars that range from round to elongated. Hubble assigned numerals to indicate the degree of elongation, ranging from E0 for round and E7 for highly stretched. A sampling of galaxy forms. Clockwise from upper left: Messier 87 "Virgo A" (elliptical), Messier 102 "Spindle" (lenticular), NGC 1365 (barred spiral), NGC 4656 "the Crowbar" (irregular) and Messier 81 "Bode's Nebula" (spiral). All except NGC 1365 are visible on spring evenings from midnorthern latitudes. Spiral galaxies have a central bulge encircled by a disk made up of two or more spiral arms. We commonly see dark lanes of dust and gas wrapped around them, too, which helps reveal their structure. Lenticular galaxies also have disks surrounding a bulge, but no spiral arms, gas or dust. Irregular galaxies are the "leftovers." They don't fit into any of the other three categories, but many are probably spiral galaxies that have been disrupted by a gravitational interaction with another passing galaxy. Irregular galaxies tend to have high rates of star formation triggered when shock waves during the interaction caused their gas clouds to collapse. Hubble also subdivided the spiral galaxies by how tightly the arms wrap around the bulge (and therefore whether the arms are the largest or smallest feature of the galaxy). He used a lower case "a" for tightly wound, smooth arms around a bright central bulge; a "b" for less tightly wound arms around a somewhat fainter bulge; and a "c" for loosely wound arms that exhibit clumping of stars and nebulas, all surrounding a fainter, smaller bulge. Hubble's system is commonly illustrated in a tuning fork diagram, where the ellipticals plot as the handle and the spirals plot as two tines of a fork — ordinary galaxies in the upper fork and barred galaxies in the lower fork. The lenticular galaxies fall where the tines meet. The irregular galaxies are plotted separately, off to the right. In the 1920s, American astronomer Edwin Hubble created the system for classifying galaxies based on their visual appearance. The system was presented in an arrangement resembling a tuning fork. Later, astronomers Gérard de Vaucouleurs and Allan Sandage expanded the classes and added a third fork made up of intermediate spiral galaxies. Can the classification system help us understand the physics of galaxies? Current science suggests that most galaxies form as spirals. Over time, they exhaust their gas and cease star formation to become lenticular. Finally, very old galaxies experience mergers that have removed any former structure to create a featureless elliptical shape. Many of the latter are enormous. Galaxy classification is not cut and dried. In edge-on orientations, it's sometimes hard to definitely say which type a galaxy might be. Many galaxies get reassigned to different categories based upon new and better images, or the opinions of researchers. Galaxies imaged using ultraviolet or infrared wavelengths of light can change their appearance, too. Next, we'll highlight the easiest to observe examples of each major type of galaxy visible in the spring night sky from mid-northern latitudes. Below, I have prepared a table with a representative for each main class of galaxy. Although not necessarily the best and brightest example in each case, I have ensured that the galaxies are observable from mid-northern latitudes in the spring evening sky. It's essential that you seek out a dark sky for viewing the galactic zoo. For best results, choose any clear, moonless night between the last quarter and a day after the new moon. Many of the brighter galaxies can be seen in binoculars under a very dark sky away from urban-light pollution, but a telescope will be needed to see the shape and structures that define each class of galaxy. In your astronomy app, the brightness of the galaxies will be expressed by their visual-magnitude value; the lower the number, the brighter the object. Amateur-grade telescopes in the 4- to 8-inch aperture range will be able to show you galaxies with visual magnitudes of around 8 to 10. Note that telescopes of that size will not collect enough light for you to see the fainter portions of the galaxies, nor trigger the color receptors in your eye. Watch for astronomy clubs who might be holding dark-sky observing parties in your area. There will likely be some much larger aperture telescopes at those events. The SkySafari app allows you to create an object list and then highlight the items on the sky (blue circles). This chart for the eastern sky on April 14 at 10 p.m. local time shows the spring galaxies in the accompanying table. When the galaxies are near the zenith (directly overhead), they will look their best. The following table provides an example of each main type of galaxy. To find one using your app, search using the New General Catalog (NGCnnnn) designation or the Messier Catalog number (Mnnn), when given. I have also provided common names, the abbreviation of the home constellation's name, the visual magnitude (remember — a lower value means it is brighter), the dimensions expressed in arc-minutes, and the distance from the sun in millions of light-years. Note that a full moon is 30 arc-minutes across, so a galaxy with the dimensions of M81 is nearly as wide as the moon! If you are using the SkySafari 6 app, enter the galaxy's designation into the search bar and then tap the Center icon. Referencing the app's display, you can try to navigate to the galaxy by hopping from nearby visible stars, or enable the compass mode in the app and hold your device up to the sky. For the objects you can't manage to glimpse, tap the Info icon in the app to see high-resolution color images of the galaxies and read about their physical characteristics, such as their supermassive black- hole centers. In the SkySafari app, if an object's information screen doesn't include an image, tap the More icon and select Show DSS Image. The app will retrieve a black-and-white image from the Sloan Digital Sky Survey. These represent just a fraction of the galaxies you can hunt down with your app. You'll have better luck with the brightest ones. However, if you have access to a large telescope and a dark-sky site, sweep the sky in the region between the Leo's tail, marked by the star, Denebola, and the next major star below it, Vindemiatrix in Virgo. This region is home to the Virgo Supercluster of galaxies. There are countless galaxies here. Switch your astronomy app to the Red Night Mode (to save your dark adaptation), and use it at the eyepiece to see if you can identify individual galaxies. It's a challenge. The Virgo cluster extends north (toward the Big Dipper) into Coma Berenices. Astronomers think the spiral galaxy that most closely resembles our own Milky Way is this one, NGC 6744. While the structure is the same, it is estimated to be twice as massive. The pink and purple knots show where new stars are being created. The galaxy's light has taken 29.8 million years to reach Earth. Unfortunately for Northern Hemisphere skywatchers, it is visible only from the Southern Hemisphere. The Southern Hemisphere skies host some of the most exotic denizens of the galactic zoo. Using your app, search for NGC 1365 and look at the picture. This SBb-class galaxy is in Fornax, which means "the Furnace" in Latin, and is 61.6 million light-years from the sun. It has a pronounced bar and two very prominent arms. And don't forget to check out the Large and Small Magellanic Clouds. These two satellite galaxies of our Milky Way are only 163,000 and 61,000 light-years away, respectively. They are both classed as intermediate spiral galaxies with irregularities. Astronomers believe that NGC6744, a galaxy visible only from the Southern Hemisphere, most closely resembles our Milky Way. Situated in the constellation of Pavo, which means "the Peacock," Pavo is an SABb- or SABc-class galaxy featuring a stubby bar-shaped core surrounded by a faint ring and then beautiful, loosely wound arms that are loaded with clumps and knots of star-forming regions. The galaxy is oriented almost face-on to Earth, giving it an oval shape measuring 20 by 13 arc-minutes. It is estimated to be about twice as massive as the Milky Way. And, at 29.8 million light-years away from the sun, if there are any spring galaxy-hunters looking back at us, they are seeing our galaxy in the distant past. Although you can't observe NGC6744 from the Northern Hemisphere, you can still search for it in SkySafari 6 and view a picture of our bigger twin sister! In upcoming editions of Mobile Astronomy, we'll look at spring binocular stargazing, how we measure the distances to stars, how their gradual drift in position will one day change our familiar constellations, and more. In the meantime, keep looking up!